"It is easy to be the person you have always been, for it requires no change, no self-reflection and no growth. It may appear that changing means giving up something. In reality there is no need to give up anything...you must simply add to what has been." Change...we really struggle with it, don't we? We resist it, fight it, complain about it...and it still happens. 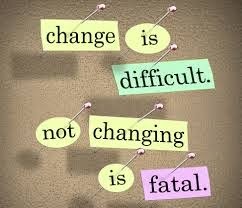 I'm giving a presentation about change in September, which is probably why the above quote found me. I opened the book to a random page, and there it was. Change is something we all face more often that we might like. But, when you think about it, change is what keeps us going and growing. Change is all about adding to what you already have, so make friends with it and embrace it. It is you old and ongoing friend.